*Sorry, this is long. Even for me. New Moon is the least accessible of the first three Twilight books (Breaking Dawn is a whole nother ball of wax). It was my least favorite book when I first read it. As I've come to understand the Twilight Saga as a whole better, my appreciation for the book has grown significantly. The frustration? It's the obvious one. It drove me absolutely insane that Bella essentially died when Edward left. I spent much of the book wanting to slap her. I would never have acted like that if a boyfriend broke up with me and I would not want any girl (or guy for that matter) to act that way. But my opinion has changed. Bella and Edward aren't just boyfriend and girlfriend. Their relationship is other-worldly. In Stephenie's vampire lore, when vampires mate their relationship is impenetrable and unbreakable. If one was lost, the other would mourn forever. I view Edward and Bella as having this relationship despite the fact that Bella is still human. In a related, but slightly different interpretation, Stephenie said when she wrote about Bella in New Moon, she envisioned how the unending, horrific pain she would feel if she lost a child. It's not pain that goes away over time (Source Twilight Lexicon). New Moon is a much different book when I put aside my biases toward how a normal girl should react when her normal boyfriend leaves. I have to remember that nothing about Bella and Edward is normal. While it is depressing, I now like reading about the intensity of Bella's despair. I particularly like how the pages for October, November, December, and January are blank. It's subtle but says so much. Now for Jacob. I wasn't a big Jacob fan at the beginning. I wanted Edward - my one true love! I've grown to like Jacob much better once I knew that he would eventually be happy residing in a separate kennel than Bella. Jacob is a breath of fresh air in New Moon. Jacob is easy. What's even better, Jacob shows that Bella has a personality. Around him, she's relaxed and full of sarcastic jokes. I believe that Bella and Edward joke around and have fun together, we don't get to see these light moments much in the series. Much of Bella's personality is revealed through Jacob. In the ideal world, Jacob and Edward would be the same person. Her one true love would also be a sunny best friend. But that's not how it is and Jacob certainly plays an important role in the series. The part of New Moon that I immediately liked and have re-read many, many times begins at Alice's return. I love how much their brief interaction said about their relationship - how comfortable Bella and Alice are together. This initial scene with Alice is one of the few concentrated parts of the book where Alice is quite serious. It's easy to mistake Alice as nothing more than a perky ball of sunshine. But much of her presence in New Moon shows that she is years older and has much more knowledge and experience than Bella. She is taking care of her. You even see her temper (and perhaps a telling sign of her relationship with Rosalie) when she lashes out at Rose for telling Edward of Bella's "death." The Volturi scenes are always exciting, even when I can come close to reciting them. The first time I read the book, I really didn't know whether Bella and Edward were going to get out of Italy alive (well, I did know because the other two books were already published, but still...). Stephenie did a fabulous job of keeping the suspense high. When one danger passed, a bigger one lurked just beyond. Apart from the danger, the introduction of the Volturi was a terrific addition to the vampire world-building. I loved seeing the old-world vampires as well as learning about the vampire "government". Their feeding methods were especially fascinating. One thing about New Moon that has always bugged me is that Alice didn't know that Aro could read minds with physical touch. Especially since Carlisle lived with the Volturi, I would think all the Cullens would know the Volturi's powers. I wonder if Stephenie had a reason that Alice didn't know or if it was an oversight (there are, unfortunately, numerous oversights in the world-building). New Moon follows the formula for a second book. The happy couple starts out happy, then their relationship falls apart for some reason. Love Interest #2 comes out of the woodwork and grows increasingly close with our heroine/hero. Then some big, dramatic, dangerous climax occurs. Couple is reunited and once again happy, but Love Interest #2 remains a rock in heroine's shoe - sticking around for the ultimate show-down in book three. New Moon was the first book I'd read with this theme. I've read dozens since that could be almost the same book if you change a few names and paranormal creatures. I wonder if the formula became prevalent after the Twilight series became popular or if it's been around for a long time. Does anyone know? If I were to rank the Twilight books in order of affection, Eclipse is at the top followed very closely by Twilight followed even more closely by New Moon. Breaking Dawn would be a step or two behind the other three. It's not that I dislike New Moon. Certainly not. I love it - much more now than I did at first. I simply love Twilight and Eclipse more. This was my least favourite of the three when I first read them too (as you said, Breaking Dawn is a whole other story!) I've been tempted to re-read the books lately. I've only read them once and I'd like to see what I think of them now that I've read so many other YA books (at the time of reading Twilight I didn't read YA). loved your review. i loved the blank pages ... i think she did that so effectively! i also loved in new moon how they transferred it to the movie ... by her sitting in a chair in her room, watching the seasons pass... i am so excited to see breaking dawn.! Love this book! I don't know how many times I have said it but I love this series. New Moon and Eclpise are my fave. I love your review. I agree. This book isnt one of my favourites too. I found when I was first reading it, I wanted to strangle Bella. 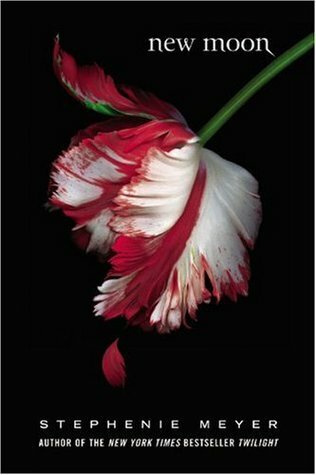 As I was always team Edward, I didnt like hearing more about Jacob too, so that had me putting down the book every few pages. I think I may re-read it though and see if I can appreciate it in a different way. I just realized that comment was unnecessarily long. Sorry about that! I had similar issues with NM, but the scene I read over and over again was Chp 23 "The Truth" where Edward finally has his epiphany (see, I told you I read it several times :) ). What I loved about NM was Edward's realization that he can't live without Bella. To me that made Bella's pain seem more balanced. As for Jake, I didn't appreciate him until a reread and the shock of Edward's sudden departure. Now he's one of my top 3 favorite characters. "I've grown to like Jacob much better once I knew that he would eventually be happy residing in a separate kennel than Bella." Ha ha ha! I loved this line not only because of your subtle use of kennel, but that's exactly how I felt about Jacob. Although, I had more murderous thoughts about him at first, literally and figuratively. Yeah, NM didn't win me over with the first read. I remember hating the Jacob POVs. I wanted my Edward, too. But I enjoyed it much better the second time around. TT has been so awesome so far, Alison! I'm so ready to watch the movie. You sound like my students when they rave about the Twilight books! I'm not a huge fan (ducks the rotten fruit flying her way) but I can respect her character development. Awesome review, btw. I liked this book, but a large part of that is because I don't really like Edward (*ducks for cover*) I like that he was out of the picture for a good part of the book and I liked seeing Bella loosen up and have fun with Jake. But her depression was such a dragggg. I also liked this book because it was the first real introduction to all of the history and expansion of the vampire lore with the Volturi. I love that kind of world building.